The ASH i Antwerpen, Belgia: Bestill nå! A cancellation fee will be charged in case of cancellation six weeks prior to arrival. The amount will be the balance of the amount already charged. In case of a no show, the entire amount will be charged from your credit card. We require 50% of the balance due in order to guarantee your group booking. We will contact you for payment once we receive your booking. We are a hostel with modern design, which opened in 2014. Offering dormitories from 3 to 18 guests as well as private double/twin rooms! Here at “The Ash!”, we’ve got what you’re looking for! In addition, we also provide free high-speed internet throughout the building, a state-of-the-art communal kitchen, free daily walking tours, a games area, a social common room, a lovely garden, a library and a reception team who are always happy to help with anything that might make your stay just that much more enjoyable in our diamond of a city! 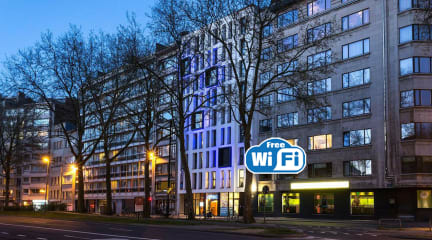 The ASH-Antwerp is very centrally located with the main shopping street (De Meir), and Antwerp's award-winning train station (Centraal Station), being just a stone's throw away or a 5 min walk! In addition, we are a brisk 10 - 15-minute walk from famous Antwerp attractions such as The MAS Museum, The Cathedral of Our Lady, The Red Star Line Museum, Grote Markt, Rubens House, Museum of Modern Art, Antwerp Zoo, Stadspark Antwerpen and De Koninck Brewery just to name a few…. From Antwerp you can also easily visit Bruges, Brussels or Gent as well as Leuven, Mechelen and Lier for a unique day trip by Train or Bus! In addition, Antwerp is a very convenient stop between Paris, Amsterdam, and London as we are on the Thalys train line and at a short distance from the Eurostar station in Brussels-South. Why wouldn’t you…? From our strategic location to our modern well-equipped rooms to our competitive prices, everything about The ASH has been carefully thought through to make your stay as enjoyable as possible. Set to the backdrop of this beautiful city known as the diamond capital of the world, we try our best every day to make your stay as comfortable and carefree as possible. As we are a group of international travellers ourselves representing all four corners of the globe, we understand your expectations and try to anticipate your needs before even you think about them. ● When booking a bed(s) in a dorm room, the hostel cannot guarantee that guests travelling together will be staying in the same room. We suggest either booking a private room/whole dorm or sending us an email when booking is made to request this. ● For stag/hen parties, please contact us directly. The ASH reserves the right to deny entry to anyone who behaves in a way that negatively impacts our other guests stay. Please also be aware, stag/hen parties will be required to provide a copy of all members ID’s as well as leave a valid credit card to be used as a deposit. ● In the event of Force Majeure (governmental action; fire; flood; earthquake; power failure; riot; explosion; embargo, transportation interruption of any kind; terrorist attack; acts of God…) affecting your booking, the Hostel cannot be held liable should your stay not be possible. Full payment is still expected, and alternative dates will be provided to which the already paid funds can be transferred. Cancellation policy: 5 days before arrival. In case of a late cancellation or No-Show, you will be charged the first night of your stay. We will charge the first night, 2 days prior to arrival in order to guarantee reservation. Non-refundable reservations: Bookings are non-refundable and non-adjustable from the time the reservation is made. Booking will also be charged immediately after it is confirmed. In case of a late cancellation or No-Show, you will be charged for the entirety of your stay. Check out before 11:00. Later check-out can be requested and subject to availability granted at an additional payment of 50% until 14:00. Later than 14:00 would incur an additional night charge at the daily applicable rate. If you are looking for a twin room, please reserve a, “Standard Double” and send us an email requesting this. All city taxes are included. The maximum stay policy is 14 days within a 6-month period. For anything longer than this, please contact the hostel directly. For bookings over 8 people, please contact the hostel directly. Our Groups Team will assist you with your booking and any additional requirements. ● Towels are available to rent from reception at the rate of €2,00. Please note, all private double/twin rooms come with towels included. ● Soap and shampoo are available to buy from reception at the rate of €3,00. Please note, all private double/twin rooms come with soap and shampoo included. I really liked this hostel. The locatian is right between the central station and the "old" city, which makes it easy to visit the city and to get transport. The staff were friendly and took their time to help me when I asked questions. I also liked the facilities. They have washing machines, kitchen, common area, they sell drinks there (including beer and coffee) and the breakfast was nice. Also, the rooms were clean had everything I needed.